CAPE MAY – The numerous bed and breakfasts here attract visitors year around, but the choices of where to stay decrease dramatically on Christmas Day. It’s not that there’s no room at the inn, it’s just that the inn isn’t open. Some innkeepers close during the holiday season and don’t reopen until February or the spring. Others shut down for just a few days before and including Christmas Day, so they can spend time with their families. There is a belief that few people will need a place to stay for Christmas. One of the newer innkeepers here, Cat Cronin is breaking from the pack. Most bed and breakfast places are closed on Christmas Day, but her place is open. “I live here. I have no place else to go,” said Cronin, who took over the Primrose Inn on Lafayette Street in May 2007. The Primose Inn was open last Christmas Day, but no one called to make a reservation. Last Thanksgiving and Christmas, she brought food to the local Veterans of Foreign Wars hall. This past Thanksgiving, Cronin arranged through the Red Cross for two 20-year-old Coast Guard recruits to have dinner at her place. Cronin will host two different Coast Guard recruits today and is open for anyone who needs a place to stay tonight. Besides the recruits, Cronin will spend the day serving a roast beef dinner to her sons Chris, 24, Jack, 20, and her husband will come down from northern New Jersey, where he still lives. One of the first inns here to cater to Christmas Day guests was the Queen Victoria Bed and Breakfast on Ocean Street. In 1981, the Queen Victoria started opening for Christmas and never closed, which is a tradition that lives on to this day. It didn’t have a seasonal mentality and had a bank that required a mortgage payment every month, said Joan Wells, who co-owned the Queen Victoria with her husband from 1980 to 2004. “In the early years, no restaurants were open to feed people. We planned a package for a Christmas Day dinner. (Doing) the cooking wasn’t so bad,” said Wells. 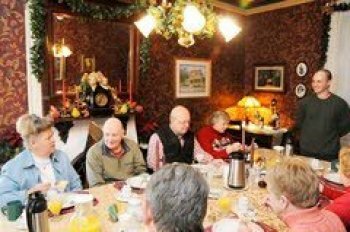 People stay on Christmas Day at bed and breakfasts for different reasons, Wells said. The explanations ranged from family estrangement to young couples with a desire to do their own thing and not worry about whose relatives they will spend the holiday with, to people who want to start a new tradition after death or illness in the family. Running an inn is tough work. Running an inn when pregnant is even tougher, running an inn when pregnant and taking care of a toddler and preparing for a holiday is toughest of all. Welcome to this year’s Christmas for Lisa Matusiak, who is due in March. Matusiak, 38, is an innkeeper at the Bacchus Inn. She’s been in the business for six years, so she knew what she was in for. Matusiak handles making breakfast and does the business’ paperwork while her husband, John, 37, spends more time entertaining guests and doing maintenance, but throw in a young family, with another child on the way, and the demands can sometimes be daunting. The Matusiaks arranged for all their guests to leave by Dec. 21 and will reopen on Dec. 26. The holiday season of 2006 offered bigger obstacles even though Matusiak arguably faced more demands on her time this year. With the Bacchus Inn consisting of two buildings – the Main House at 719 Columbia Ave. and the Cottage at 710 Columbia Ave. – the couple, who live here, do a great deal more holiday decorating than your typical homeowners. They put up four Christmas trees and started their exterior decorating before Thanksgiving and the interior decorating afterward. J.T., now 2 1/2, is old enough to help out by holding something or handing it over. The Matusiaks make a point keep J.T. away from guests unless they ask to see him, and they do. Repeat holiday season customers usually bring something for the couple or J.T. when they visit. “It’s an extended family or a bunch of nice friends,” said Lisa Matusiak about their repeat holiday season customers. If J.T. has an ear infection and they receive less sleep during a night in the holiday season, which happened earlier this month, they just have to roll it. On the mornings where mom needs more sleep, dad adopts more of the Mr. Mom role and rises out of bed earlier to take care of their son. “I have to be regimented. I have always been organized and good at coordinating things, but this is more than I ever handled,” Lisa Matusiak said. Come stay at The Bacchus Inn Cape May Bed and Breakfast for a wonderful Cape May Christmas. This entry was posted on Thursday, April 30th, 2009 at 4:21 pm	and is filed under Uncategorized. You can follow any responses to this entry through the RSS 2.0 feed. Both comments and pings are currently closed.